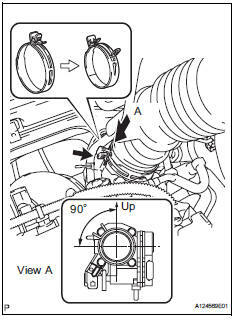 Install a new gasket onto the intake manifold. 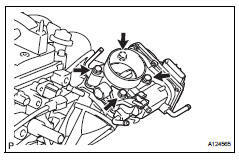 Install the throttle body and fuel pipe clamp with the 4 bolts. Connect the fuel tube into the clamp. 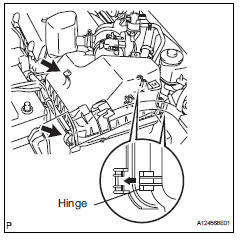 Connect the wire harness clamp. 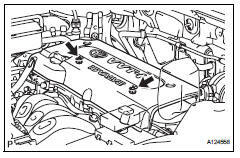 Connect the throttle position sensor and control motor connector. Connect the no. 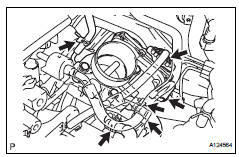 2 Water by-pass hose to the throttle body. 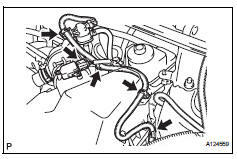 Connect the water by-pass hose to the throttle body. 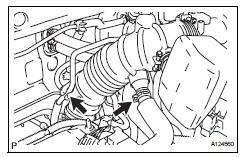 Connect the purge line hose to the throttle body. Install the air cleaner filter element onto the air cleaner case. Insert the hinge part of the air cleaner cap into the air cleaner case, then hang the 2 hook clamps. Align the matchmarks of the no. 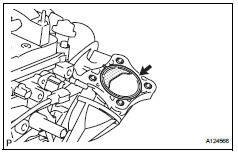 1 Air cleaner hose and throttle body, and then connect the air cleaner hose no. 1 To the throttle body and unfasten the no. 1 Air cleaner hose clamp. Make sure that the hose clamp is at the correct angle. Connect the purge line hose to the clamp. Connect the no. 2 Ventilation hose to the air cleaner hose. Install the cover with the 2 nuts.